Great article and thanks for the quote..I do love the Rogue and I've owned many mighty analogues over the years. It may not be the most versatile synth but what it does do, it does well and it still surprises me after all this time. 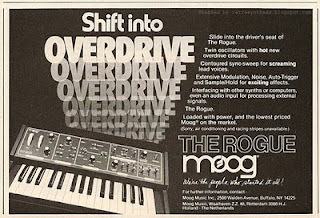 It is also worth mentioning that, while many of my microprocessor based synthesizers that SCI, Moog and Roland were putting out at the time have all needed a fair amount of maintenance work with dead voices etc, the Rogue has never even required calibration and is still tune perfect. I just wanted to say THANK YOU!!! for this wonderful depository of vintage synth ads!!! !